Atlanta is located in a business-friendly state and is the site of the busiest airport in the world (the Hartsfield-Jackson Atlanta International Airport), so it shouldn’t come as any surprise that it has become a popular choice for businesses planning to expand or establish their headquarters. It also shouldn’t be a huge surprise that Atlanta is in the top 10 for US cities with the most visiting business travelers. If you’re going to be spending time in Atlanta for work, you may be wondering where you should stay. Learn more about Atlanta’s five biggest business districts below so that you can choose a location that’s close to your company—and a place that you can enjoy in your leisure time. Atlanta’s downtown area is the city’s central business district and is the home to several major corporations, including The Southern Company, SunTrust Banks, and PulteGroup. It’s also home to a wide range of attractions that appeal to tourists, business travelers, and residents alike. 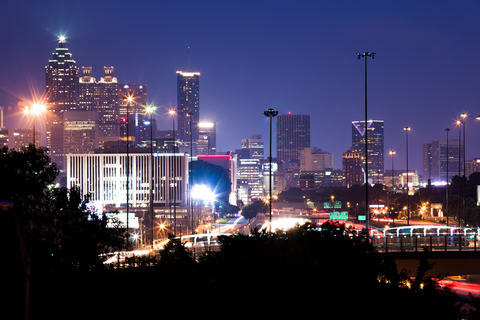 These attractions include Piedmont Park, Fox Theatre, the Georgia Dome, and the Underground Atlanta entertainment center. Located just north of Downtown, Midtown is Atlanta’s second largest business district. It boasts more than 65,000 jobs and over 15.5 million square feet of Class A office space in just 1.2 square miles, and it is the home of Coca-Cola, Equifax, Invesco, and Earthlink corporate headquarters. However, Midtown isn’t just a haven for large businesses—it’s also a popular place for working professionals to live and for business travelers to stay. The district’s extensive network of sidewalks and bike lanes make it easy for residents and visitors to get around without a car, and the more than 150 restaurants in the area provide opportunities to sample just about every cuisine imaginable. Buckhead, which lies just north of Midtown, is well-known as being one of Atlanta’s major retail districts. In fact, Buckhead has the highest concentration of luxury boutiques in the country. The district may be known as a place for upscale retailers to hang their shingle, but more recently, there has also been an influx of tech startups and venture investors. Growing companies located here include BitPay, SalesLoft, and Cloud Sherpa. Perimeter Center is an edge city that developed after the opening of the upscale Perimeter Mall in 1971. The mall is still operating today, and skyline of Perimeter Center has expanded to include condos, high-rise offices, and more. Fortune 500 companies headquartered here include UPS, First Data Corporation, and Newell Rubbermaid. There are over 29 million square feet of office space in this district, and more than 123,000 people work in Perimeter Center. Thanks to the three MARTA stations located in Perimeter Center, it’s easy for workers and residents to commute in and out of the area. Located in northwest Atlanta, Cumberland is the fifth largest business district in the Atlanta Metro area (behind the four districts listed above). Some of the major corporations headquartered here include Home Depot, Travelport, and The Weather Channel. The Atlanta Braves are currently building a new stadium—SunTrust Park—that will be surrounded by green space and mixed-use development. Premier Corporate Housing now offers corporate housing properties within the Atlanta Metro Area. Contact us for help with your corporate travel accommodations or for information about where to stay. We have properties available in Downtown, Midtown, Buckhead, Dunwoody and many other areas within the Atlanta Metro.